This weekend we have been home on the farm, mainly because it has been too cold to go out and the young Master Vander-cave has been busy helping the farmer look after the tiddlers. Now for those of you not schooled in farm speak, tiddlers are the lambs that are orphaned and there are no spare ewes to adopt them or they are the smallest lambs who would not grow well if left with their mothers. I was informed yesterday by my son that these tiddlers had to be fed three times a day on milk and sheep cake so they grow fat because the fatter they are the better price the farmer will get at market for them. My son and the Farmers youngest child would happily spend all day helping out on the farm. Watching the two friends confidently carrying a new born lamb each whilst the mother trots along behind as if this is the most normal thing in the world to be doing on a Sunday morning is quite amazing! My son's attitude to the whole process of birth, life and death maybe forever skewed by his time on the farm. Only last week he was complaining about a ewe taking a whole half an hour to give birth and the farmer having to pull the lamb out. I pity whichever girl my son ends up having babies with because I fear they will get little sympathy on the labour ward! So whilst Master Vander-Cave was busy outside and I didn't have too much to do I decided to have another go at fruit bread. I love it toasted and although you can buy fruit bread in the supermarket I am usually left feeling like I would like a little more fruit in the bread and a touch more warm spice. Over the years I have made various attempts at making fruit bread in my bread maker, but it never seems to rise well and often ends up very dense and inedible. So today I thought I would have a go at making it from scratch. The key here is time. One cannot make bread in a rush because bread needs lots of kneading time followed by lots of rising time. Without time for both of these activities the bread will be flat and inedible. After trawling through my recipe books for a suitably fruity enough bread I found in my trusty Complete Cookery Course a recipe for Bara Brith, which is a Welsh fruited bread. As we live not too far from Wales I figured I would give it a whirl. Now at this point I have to admit that I did cheat a little and use my kenwood chef with its dough hook to make the dough and do the heaviest of the kneading. I then removed the bowl from the mixer and allowed the dough to rise in the bowl covered with clingfilm. 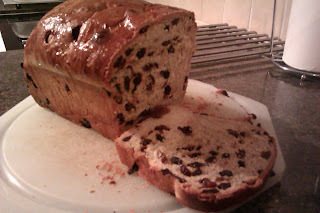 I was really pleased with this loaf it has a lovely texture, a fruity flavour and a nice sticky crust. And it toasts like a dream. You will need a 2 lb (900 g) loaf tin, well greased. First warm the milk in a jug in the microwave until it is hand hot . Whisk in the teaspoon of sugar, followed by the yeast, then leave it in a warm place to froth for about 15 minutes. Now sift the flour and salt into a large mixing bowl, stirring in the remaining 2 oz (50 g) sugar as well. Then rub the fat into the dry ingredients until the mixture looks like fine breadcrumbs. Stir in the mixed spice next, then pour in the beaten egg and frothed yeast, and mix to a dough. Now turn the dough on to a floured surface and knead until smooth and elastic (about 10 minutes), or if using a mixer with dough hook allow the mixer to knead the dough for around 5 minutes. Replace the dough in the bowl and cover with a damp cloth or some clingfilm. Leave in a warm place to rise until it has doubled in size – about 1½ hours. After that, turn the dough out and knock it down to get the air out, then gradually knead the fruit in and pat out to a rectangular shape. Roll it up from one short side to the other and put it in the loaf tin (seam-side down). Place the tin inside an oiled plastic bag and leave it to rise, until the dough has rounded nicely above the edge of the tin (about 30-45 minutes). Meanwhile, pre-heat the oven to gas mark 5, 375°F (190°C). Turn the loaf out, holding it in a tea-cloth in one hand and tapping the base with the other. It should sound hollow – if not, pop it back upside down (without the tin) for 5 minutes more. 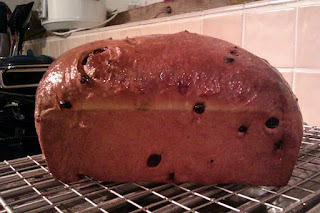 Cool the loaf on a wire rack, and brush the top with clear honey to make it nice and sticky, before the loaf cools.